Going back in time a bit, I thought I'd post a couple photos of my class work. We were all asked to bring a variety of found objects. I brought shells from our recent trip to Hawaii, and driftwood and sea glass from Seattle. David gave us each a little tin to turn into something special. Mine was just the right size for some of the shell bits I'd collected at the beach, and I decided to cover it with seemingly random stitching in sand colors as a sea treasure. 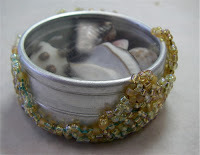 I worked with three closely related bead choices that were all yellowy-sandy colored with different finishes. And three thread colors - turquoise, tan and white, which really helped make the piece. When I walk down a beach, it is physically impossible for me not to do at least a little beach combing. Its an addiction I've had since I was a child. And I think this is the nicest display I've ever made for my shell collections. Looking at it brings back the childhood sense of wonder that first drew me to horde sea shells. One of the samples we've all worked on is a covered form, so here's mine. 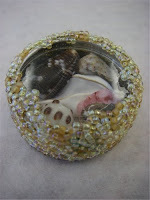 Inspired by our recent trip to Hawaii, I made a "sand-encrusted" shell collage from a tiny decorative tin.